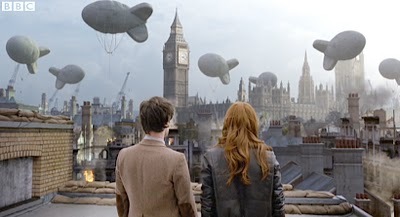 After the season-four finale I never wanted to see Daleks again, let alone a comeback so early in season five. But breathe, everyone, it's okay: Russell Davies is gone, empty-headed fanwank left behind, and real plots back in form. Victory of the Daleks is a fun World War II piece that sees Britain training an army of Daleks to be thrown against the Third Reich, and a great homage to the Troughton classic, Power of the Daleks, which similarly involved the hate-mongers feigning servility to humankind whilst really working against them. The sight of Daleks gliding around Churchill's Cabinet War Rooms, carrying files on their sink plungers and bleating out subservient inquiries like, "WOULD YOU CARE FOR SOME TEA?" (click on the above photo), are hilarious and bring home how much I miss being entertained by the Doctor's most famous enemies. But while this is a good story, it could have been so much better. Many reviewers have pounced on the biggest problem: that it's a terribly rushed episode and needed another to breathe. I almost hate to say they're right, because the last thing we wanted at this point was another Dalek two-parter. But they are. Never have I felt the constraints of the new series' 45-minute stories as acutely as in Victory of the Daleks. There's so much bombarding us that by the time we digest things, the plot has already turned with dramatic opportunities gone to waste. We needed more front time with the Daleks pretending to be humanity's servants, and to see a lot more devastation caused by the Blitz so we could be moved to sympathize with Churchill's need. The Daleks are essentially alien Nazis, and the idea of them being used against Germans in war-torn London is disturbingly ironic -- and brilliant. They would, as Winston insists, save lives. But we hardly feel the effects of the Blitz at all (unlike in The Empty Child/The Doctor Dances), and the Daleks show their true colors before we know it. Speaking of those colors, I don't quite understand the anxiety over the new model and caste system (red = drones, blue = strategists, orange = scientists, yellow = eternals, and white = supremes). I'm actually rather impressed and looking forward to seeing how the rebooted race plays out. One thing that strikes me is that the Daleks tend to mirror the tone of their era in Doctor Who. The colorful breed would have been horribly out of place under Hinchcliffe -- the atmosphere of Genesis of the Daleks practically bleeds black and gray with its wasteland setting and gothic air -- but they seem ideally suited for Moffat who revels in dark fairy tales. Granted these new Daleks have a slightly plastic look, but it's not that bad. As for Winston Churchill himself: he's fine enough, but easily the least impressive of the historical figures we've been treated to in the new series. Charles Dickens, Queen Victoria, Shakespeare, and Agatha Christie stole their shows, but if Churchill does that, it's only by teetering on the edge of caricature. 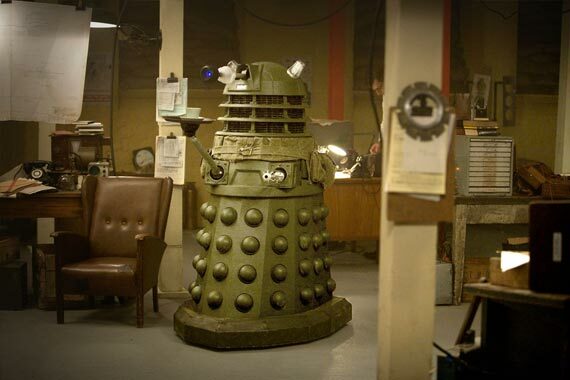 (As far as I'm concerned, the new Daleks are the show stealers.) There are some fine moments between him and the Doctor, as when he pretends contemplating taking the TARDIS by force, and then later pickpockets the TARDIS key when hugging him farewell. 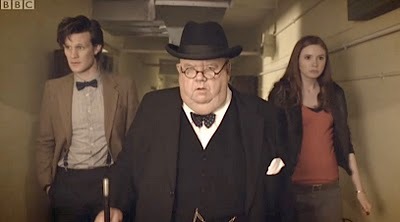 But he's about fifty pounds heavier than the real Churchill, and doesn't get much time to push the drama of his strategic war plan before his Daleks abandon the war rooms for their ship hovering over Earth, and begin executing their real plan for the Earth's obliteration. 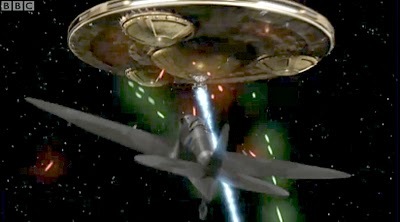 Which brings me to the preposterous space battle between the Spitfires and Dalek ship. The gravity bubble protecting the Spitfires I can buy; airplane pilots thrown into zero-g combat for the first time in their lives without any training I cannot. But since most of them end up getting blown to bits by the Dalek ship anyway, some level of credibility is saved, and believe it or not, I actually like this thrilling sequence. It gives us the delightful spectacle of British fighter planes becoming the equivalent of X-Wing Fighters attacking a Dalek Death Star. Mind you, I've always hated Star Wars, but somehow this all comes together and works in a Doctor Who context. The climax after the Spitfire attack, however, is the weakest part of the story. The way the Doctor and Amy neutralize the bomb-android who is Professor Bracewell is way too melodramatic, though to be fair, the principle behind it isn't the crap some have charged. Since the Doctor is trying to get Bracewell's positronic brain to override its self-destruct program, Bracewell must be made to want to live, and so needs to be put in touch with his most affecting memories as a human being. Even allowing for this, I would have preferred the more grim resolution of Bracewell being taken on board the TARDIS and deposited on the Dalek ship to blow it up. Perhaps that wouldn't sit well with some of the new series writers, whose sensibilities can be on the delicate side, but this is Mark Gatiss we're talking about, and he was happy enough to let the character of Gwyneth sacrifice herself to destroy the Gelth in The Unquiet Dead. On the other hand, this is the first story of the season where we at least see people getting killed, so I'll stop complaining.